Personal development writer Steven Covey was known for saying, “begin with the end in mind (i.e. 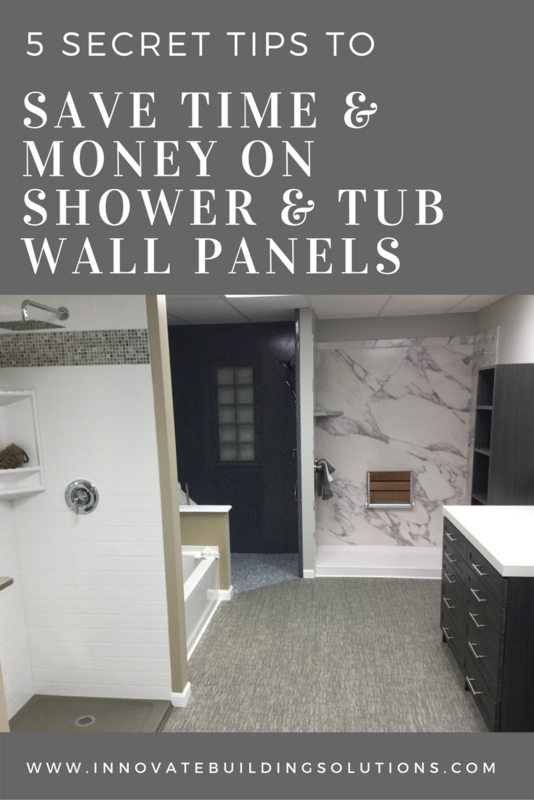 focusing your mind set on what your goals are).” This same thought process should be used when buying shower and tub wall panels so you make a sound investment. Ask yourself, “how long do I plan to stay in this home?” How long do I need this shower surround to last? If you’re looking to move shortly, putting in a luxury shower wall system like a solid surface or high gloss products doesn’t make sense (unless you live in an expensive neighborhood). On the other hand, if you’re trying to dress the home up for sale (and you live in a middle class neighborhood) a modest acrylic wall panel system could be the best answer. You’ll see below a picture from our new showroom of a solid surface wall system we find a lot of people choosing who want to stay in their homes for a while. For an even more stylish value buy the laminated wall panels are a modular system which is cost-effective and simpler to install than the solid surface units. OK – if you’re a contractor reading this don’t get defensive – but I have to “keep it real dog” as Randy Jackson used to say on American Idol. Most contractors are not knowledgeable about grout free shower and tub wall panels. Yes – they know about the basic low-cost stuff (like fiberglass) you can get at Home Depot or Lowes, but when it comes to more advanced materials they are generally clueless (or would rather sell you a tile job – because that’s what they install most of the time). Let your fingers do the research – I would recommend going on line and putting in terms like “DIY panels, wall panels, solid surface walls, high gloss walls, DIY shower, laminate shower walls and start uncovering options. The image below shows the simple to install decorative PVC wall system. Come visit us – If you’re in Cleveland/Akron or Columbus areas come see us. We have showrooms so you can see what these products look like in real life. If you don’t determine what size shower or tub walls you need you can waste a lot of time researching and pricing the wrong things. 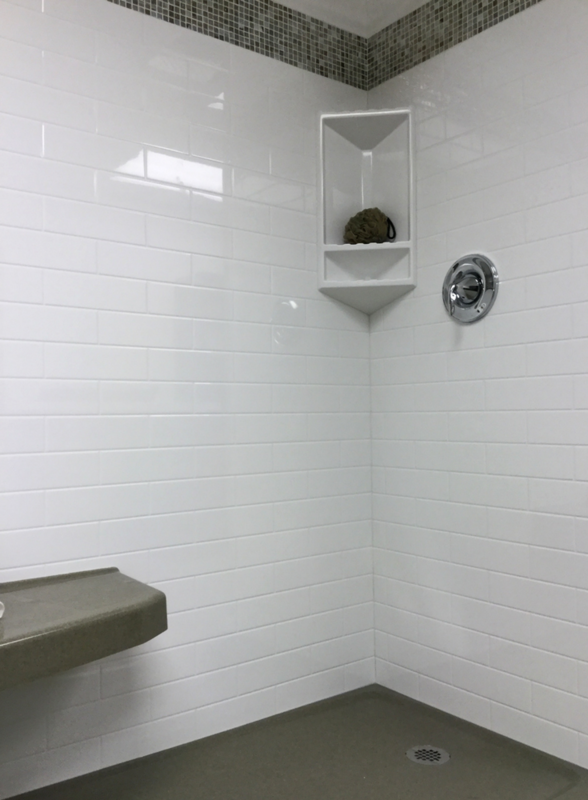 Most common sizes are available in standard kits (sizes like 60 x 30 x 60 for a tub, 48 x 36 x 78 and 60 x 36 x 78 for a shower for example). When you stray outside standard sizes some of the materials are just not available. You may wonder why. The main reason you only find materials like fiberglass only made in standard sizes is the manufacturers of these products make them in mass quantities. Their production processes are not driven to make your order in a small batch. This is exactly the opposite with a product like solid surface, which even when you are getting “standard size” (i.e. 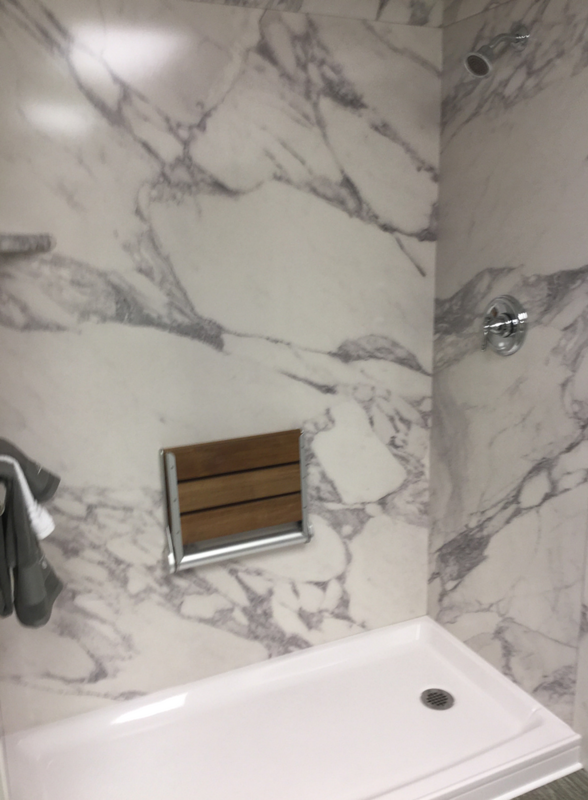 there is already a mold formed for your shower walls and shower pan) they are made for your specific color and texture combination (Check out the slate texture of a solid surface system in our new showroom below). Before you begin researching figure out if your shower panels are standard or if your shower pan is a custom size (note you can have a standard size for the pan – but if your drain is in a different spot you’ll end up needing a custom size anyway.). Don’t you love going into the grocery store and testing the tiny spicy sausage samples or latest hummus dip (it’s excellent to be able to try before you buy and waste money on the wrong thing). 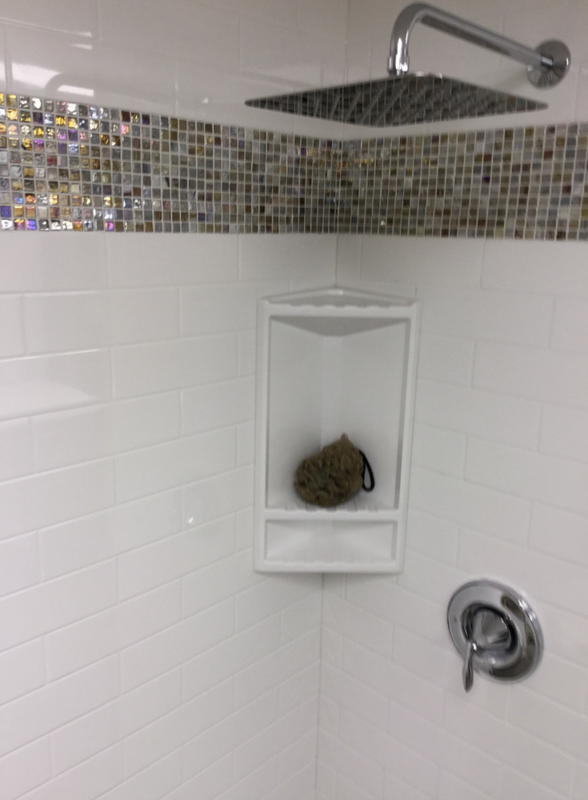 With shower and tub wall panels you can (and should) be able to “sample” before you buy. When you think about it, how can you possibly make sure what you buy will match up with the new color scheme of your remodeled bathroom if you can’t touch, feel and put the samples next to the cabinets, tile, paint color etc. you’re planning on using. If the suppliers and contractors you’re talking to want you to pick from a brochure – that’s bunk. You need physical product samples. If you have a hard time with this – give us a call. We’re sending samples out all the time – and why not, it makes sense for you to make an informed decision so you’re happy your purchase. 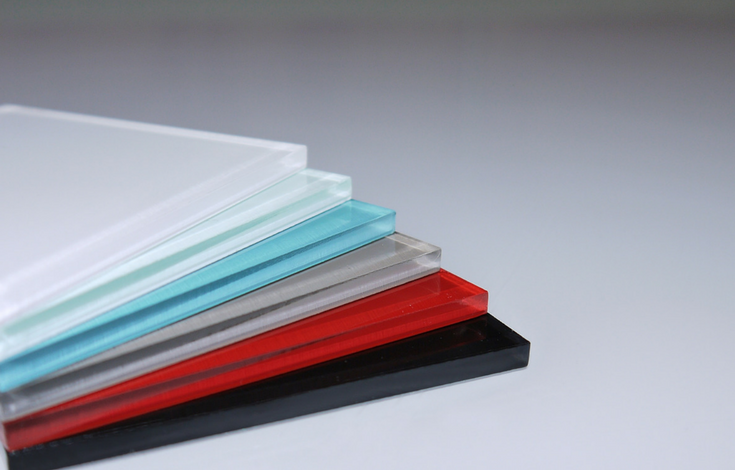 Check out the fun colors in the high gloss wall panel samples below. (Height) Where are the walls starting? If you’re looking for a low-profile shower pan which is 1 ½” off the ground you’ll need taller panels than if your shower panels are starting off a curb which is 4 ½” off the ground. (Height) Where are you placing the shower head? – In my opinion I think it’s best to drill a hole through the wall panels so the shower head comes out of the panels vs. the panel starting below the head (it makes for a more waterproof installation). Before you buy a panel system know high off the ground your shower head will be installed. In the system below the shower head is inside the panel. The metallic tile border is also fun in this solid surface wall panel system! (Width) Add a little to your initial measurements if your old system is still in place – I get a lot of calls from people looking to buy a tub or shower wall panel system where the owner tells me they need panels which are 58 ½” wide. With this size, they think they need custom size (even though I’m pretty certain what they will really want is the standard 60” width because they are measuring inside the existing walls and the right measurement is after these walls are removed). 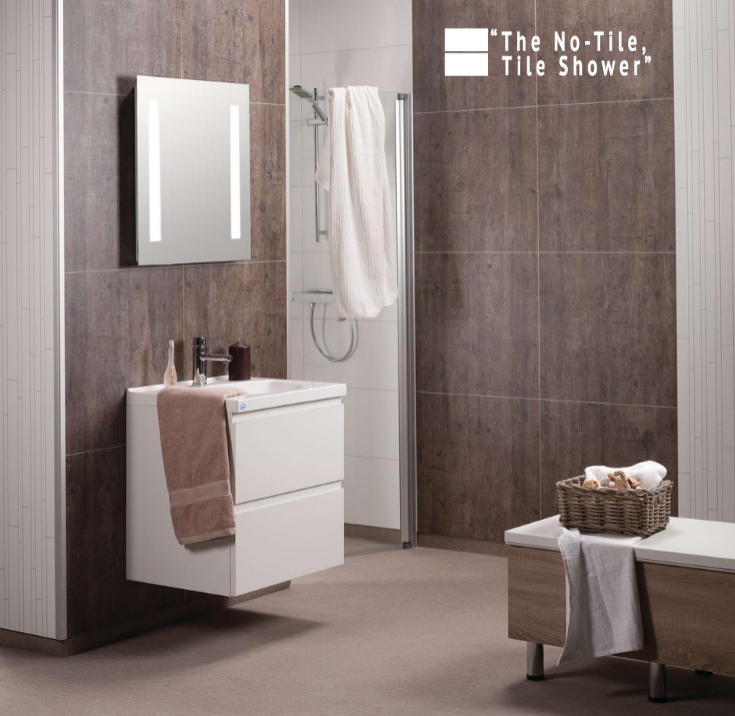 When you are measuring your existing shower, there may be tile, plaster, cement board, green board etc. behind the walls you need to add to get your proper measurement. Unfortunately measuring with the existing tile shower or fiberglass surround in place is a bit of a guessing game until the full unit is removed. If you have questions let us know. For example, the tub surround shown in our showroom below is a standard 60” but if you measure now that it’s completed it will be close to the 58 ½” I mentioned above. If you’re unsure (but you know you are going to do the project) you can cut out a small section at the top to get a true measurement without ripping everything out). 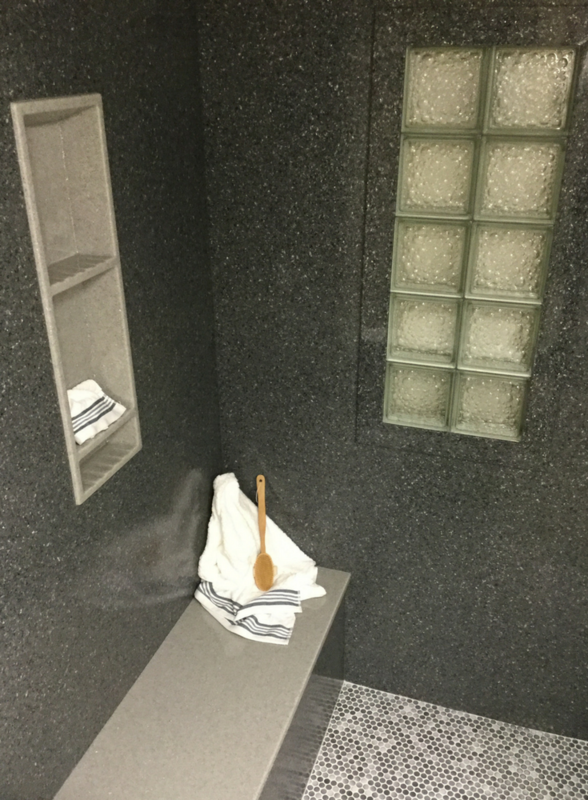 Purchasing grout free shower or tub wall panels can seem like a mysterious process but it doesn’t have to be. First know if need a “quick spruce up” before putting your home on the market, or a more permanent solution. Make sure to do your own research. Insist on seeing, touching and feeling the product. If you can see them in a showroom – that’s excellent. If not, get those product samples. Lastly, make sure you know what size you really need before you buy anything and have trouble returning what you bought. I hope this article was helpful to you. If I (or a member of my team) can lead you through the wall panel jungle (either for a bathroom remodeling project in Cleveland or Columbus, or from help from our nationwide supply division we would love to be of assistance to you. In Cleveland call Cleveland Design and Remodeling at 216-531-6085). In Columbus, call The Bath Doctor 614-252-7294. For nationwide factory-direct supply pricing (and advice) contact Innovate Building Solutions at 877-668-5888. Love the tips, thank you! 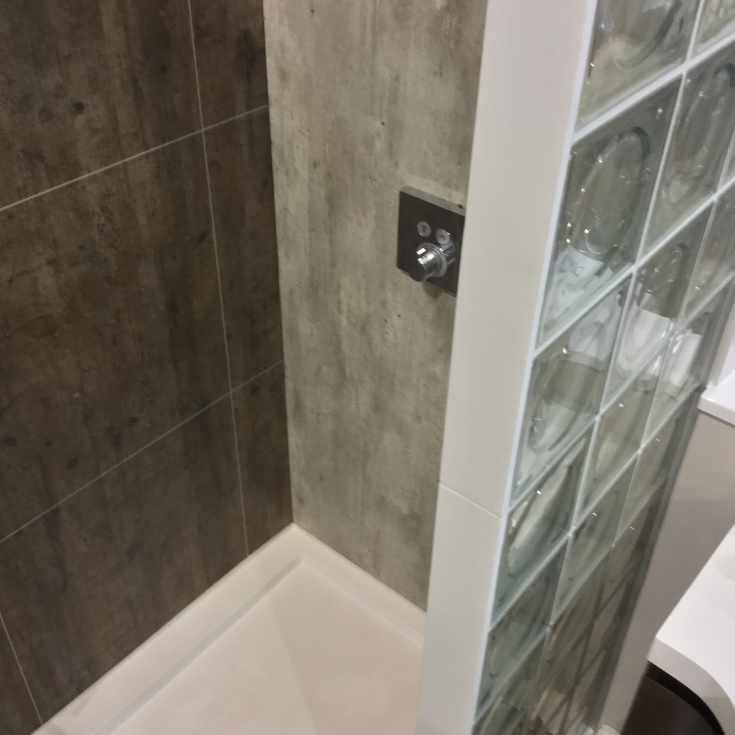 Mike – we have 2 lines I think would make a lot of sense for you – the solid surface (stone) and the decorative faux stone PVC backed composite shower wall panels. If you want to call us the number is 877-668-5888 – we’d be glad to help you! I am looking to build a grout free shower in a new weekend home I am currently building. I would like to get a 48″ by 48″ square corner shower. Two back walls and two glass walls. I have searched high and low without success so far. I am trying to avoid spending three thousand dollars for a shower. But, I don’t want cheap stuff either.